Brian S. Rosner, Paul and the Law: Keeping the Commandments of God, New Studies in Biblical Theology 31 (Downers Grove, IL: InterVarsity, 2013). This volume addresses the much-debated issue of Paul’s view of the Mosaic Law. 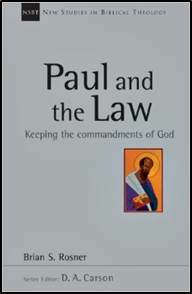 Indeed, “The subject of Paul and the law is rightly regarded as one of the knottiest puzzles in the study of the New Testament” (p. 207). Rosner notes that three theological positions have a strong interest in Paul’s view of the Law (p. 21). Lutheranism holds that Paul believed that Christ abolished the Law and that the Law is a counterpoint to the gospel. Reformed theology holds that salvation is by grace and not by obeying the Law, but once saved, Christians are under the moral aspects of the Law and must keep it in order to please God. The New Perspective on Paul holds that the problem of the Law is not that salvation is by grace rather than works but that Paul’s opposition to the Law was simply its (mis)use by the Jews to exclude Gentiles from the people of God (Jewish ethnocentrisms). He argues that the way forward is to look at all the evidence, use the biblical-theological method, and treat the law as a unity (pp. 41–43). In doing so, Rosner believes that Paul makes three moves related to the Mosaic Law: (1) polemical repudiation (e.g. 1 Cor 7:19; 9:21), (2) radical replacement with the Law of Christ, and wholehearted reappropriation of the Law as prophecy (1 Cor 8:5–6) and wisdom (1 Cor 5:13; 9:24). Rosner’s work is commendable in that he deftly tackles a fairly complicated issue in a fairly straightforward way. He is clear in his explanations and methodical in his presentation. Each chapter begins with some appropriate quotations and closes with a summary. Chapters 4, 5 and 6 are particularly good. I find Rosner’s approach persuasive and echo his own conclusion: “I am convinced that the hermeneutical solution to the puzzle of Paul and the law that this book expounds is exegetically compelling” (p. 14).